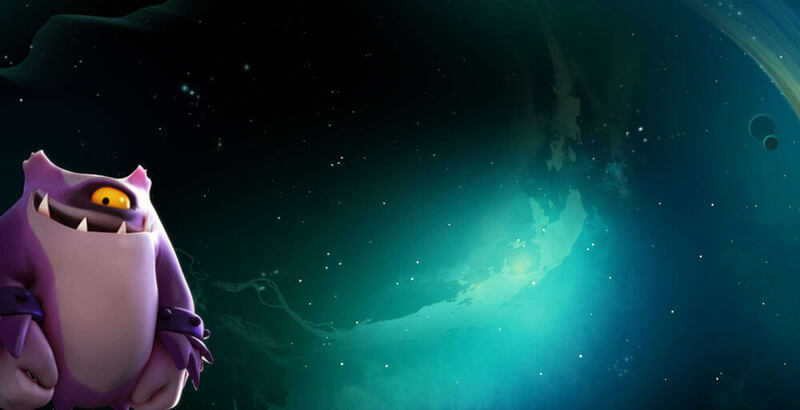 This is another exclusive space wars casino game slot from NetEnt. It is highly entertaining and adding to this it is produced with very impressive graphics. For those players that love space wars and fighting against extra-terrestrial villains, they will be at home with this game. The twist with Space Wars from NetEnt is the animation, it is reminiscent of the movie Monsters Inc. by Pixar. 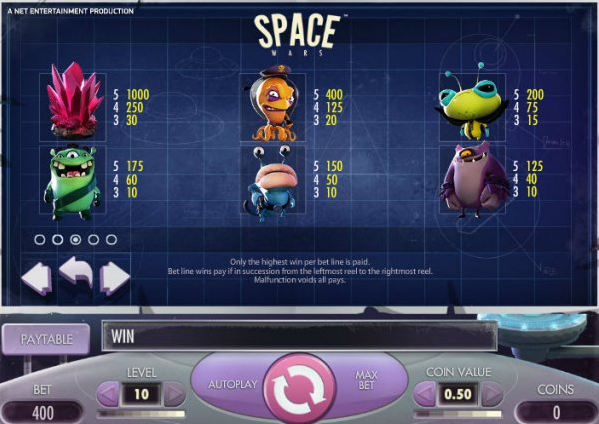 The space wars casino game is set in outer space where five weird looking monsters are fighting to gain control of the attractive spacer crystal. These monsters are the symbols and come in different colours and size with the larger the alien, the higher value it becomes. The player has to collect all the rewards during the phase of combat play. The wide-eyed monsters, which look like genetically modified organisms keep the player, glued to the screen with some teleportation options. These monsters are quirky and funny at the same time rather like something you would find in an animated movie for kids. Space Wars has 40 paylines, which are fixed, four rows and five columns. It is theorized that it has a 97% payout chance on the floor. Unique features in this game include re-spins, Stacked and Wild symbols. You also get the option of adjusting the coin values and levels. The game level has six coin values, which range from 0.01 coins to 0.50 Coins. There are ten levels of betting based on the 40 paylines. The six coin values are 0.01, 0.02, 0.05, 0.10, 0.20, and 0.50. 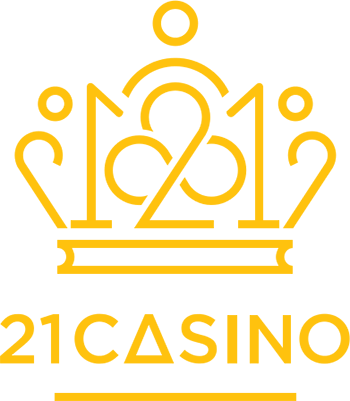 The value of coins is then multiplied with the number of coins to give the minimum and maximum bets; min €0.40 to a max of €200. The re-spins in this game are known as ‘cloning pods’. On the right hand side there is a machine called the cloning pod. When a player achieves a winning line, the symbol of that line will be entered in to the cloning pod. 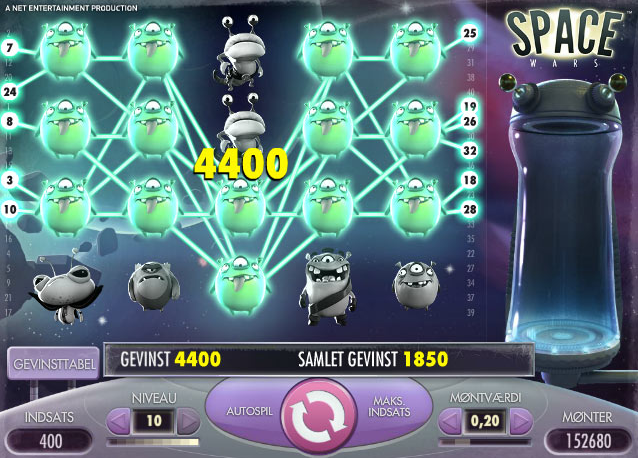 The player then gets a chance for a free re-spin, which offers higher winning chances. Wilds on this game are referred to as substituting symbols. That is because they substitute other symbols when they appear. The trick to these symbols is that they only appear on two reels; reels two and four. These symbols can appear both on the cloning pod spins and in the main gameplay. When they appear, they offer new winning lines. They can also appear on the stacked symbols, which are discussed next. The stacked symbols appear when winning symbols get stacked and form a block. This provides more winning opportunities for the player. What makes this option exclusive is the fact that they can appear both during re-spins and normal play. Another interesting feature on this game is the 1000 spin feature. This offer is available during the automatic game. Players get to bet for all the 1000 automatic spins. Gamers also have a chance of customizing the automatic spin feature to fit your liking. The skill stop feature is another epic function in the Space Wars game slot. It allows the player to stop a spin whenever they want when they are playing an automatic game or manually. This allows the player to get in charge of the game and control how fast or slow they would like the game to proceed. NetEnt have added a final unique feature for those playing this online game. The mouse can be hovered on top of a symbol to preview its payout. Several control buttons have been placed in the game. One large unique round button is placed in the middle of the bottom of the game screen. This is the start/stop buttons that control a spin. It comes in very handy when you are playing a manual game where you can stop a spin anytime you want. The ‘auto play’ button counters a manual play by giving an option to play automatically. Although it looks a bit lazy it can be used interchangeably with the manual one to create some great wins. To manage the number of bet lines to use and the amount of coins, the ‘bet level’ and ‘coin values’ button is there to help. If players would like to skip all these betting buttons and go for the jackpot, there is the ‘max bet’ that allows them to automatically make the highest bet for the game. Here players can find the sound settings where it is possible to increase or decrease the sound or simply turn the sound off. Additional game settings are found in the button known as the ‘wrench’. The ‘wrench has additional options for; changing the introduction screen where one can adjust to the type of animation preferred. Players can also get some short cuts where they can place some symbols on the space bar. If there is an issue with the Internet, for example if it’s a slow Internet connection, players can improve game graphics by adjusting their quality. NetEnt provide some four icons on the bottom left hand side of the game. If players don’t like to start and stop the slot all the time, there is an option where they can choose the automatic spin version. There is also the option of customizing the automatic option. Another interesting feature is the ‘quick play’ feature. This is for those who like the game to progress fast. Gamers can either increase or decrease the speed. If it is felt that the animations are a distraction, they can be turned off. For those who like to place their mouth where the money is, and place real money, they can use the history button to help them analyse the history in order to increase their odds for winning. 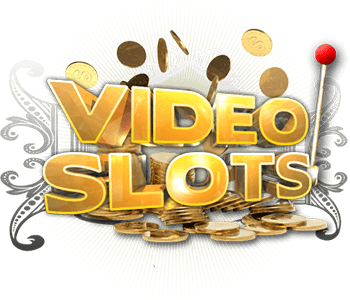 This game has received very impressive reviews from slot players around the world. It is pretty simple and very easy to master whether you play with on a desktop or mobile device. The rewards are ample. The theme and graphics are literally out of this world. Added to that NetEnt have made it available for most platforms used today such as Windows, Android and Linux.